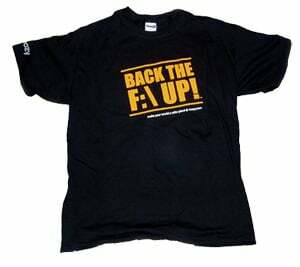 With a (D)echo of French Connection's FC UK ad campaign, Mozy is distributing t-shirts bearing the legend "BACK THE F:\ UP" to people tasteless enough to wear them. I look quite good in mine. It's not as sharp as French Connection's ads but you can't say it's a fcuk up either. The company is running a Computer Nightmare contest in which people send in a video of 'the most hilarious, inventive, and just plain wacky ways to destroy a computer' to www.computernightmare.com. Knock off your old PC in a contest-winning way and you get a trip to Hawaii with your significant other. Runners up get a MacPro, a MacBook and a Flip Video. To state the bleedin' obvious, the nerd connection is that Mozy backs up to the cloud, and Atmos, EMC's cloud storage infrastructure offering, was code-named Maui, which is one of the Hawaiian islands. Mozy has been combined by EMC with Pi in a Decho business unit.